I knew we would be good friends from the start. Catherine has that presence that compels you to be close to her, to hug her. I was instantly drawn to her simple humbleness, as if she were nothing but a small brown bird. So I approached her, wrapped my arms around her, and squeezed tight. 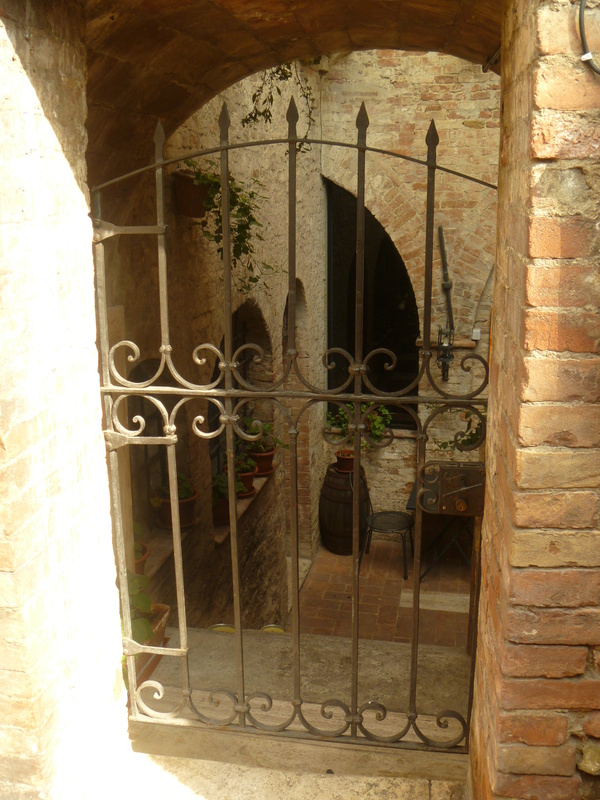 During our stay in Siena, I couldn’t escape the urge to visit her whenever I could. She made such an impression on me. Diminutive yet mighty, Catherine was a woman able to influence the greatest powers within her own country. Who was this tiny Dominican nun who collected such a large group of followers, including me? Where did her charisma come from? How did she gain the respect of the most powerful? 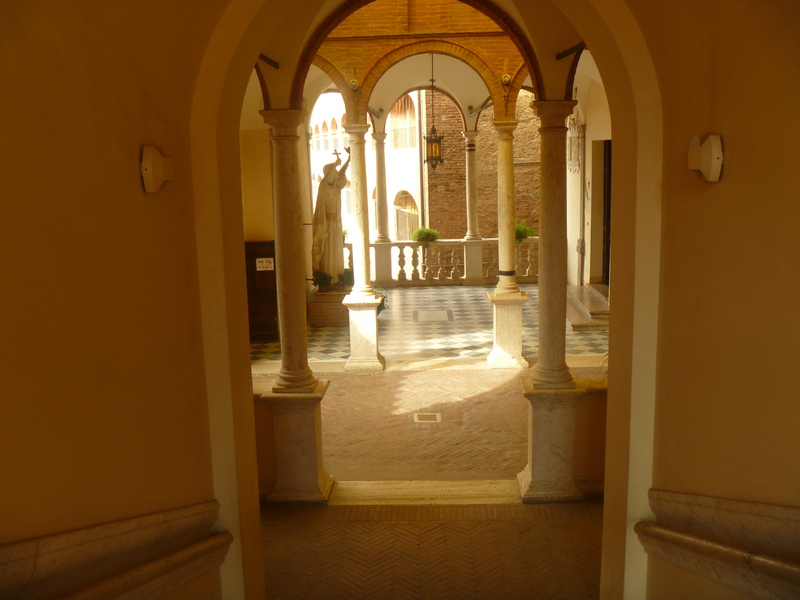 Catherine was Siena’s Mother Terese. She reached out to the poor, the sick, and the homeless. She worked tirelessly helping others through the Black Plague, bringing salvation to many. People were drawn to her radiantly joyful nature and spiritual wisdom. She was someone people wanted to be around. In short, Catherine was a saint! 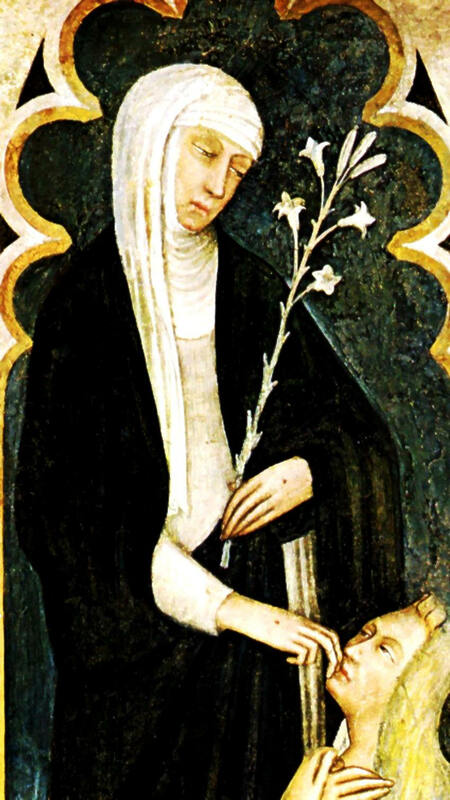 The painting above is the most accurate likeness of St. Catherine known to exist. 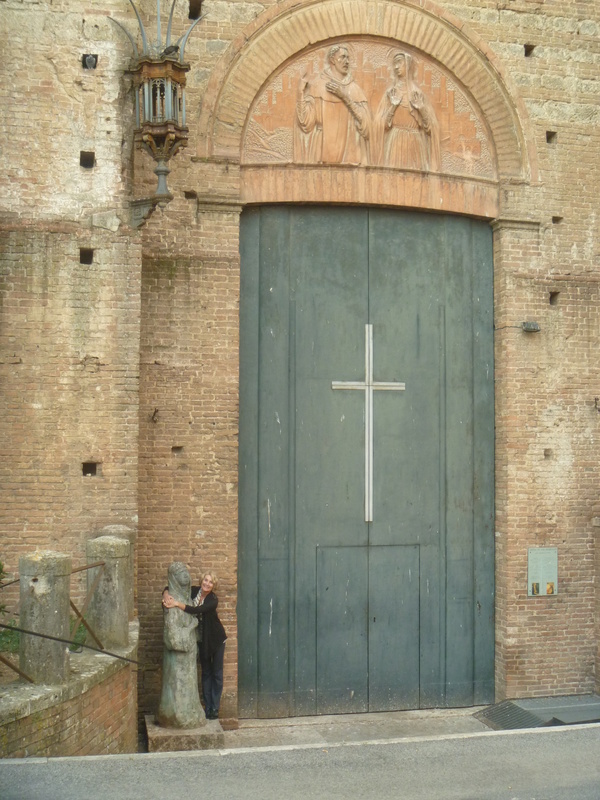 It was painted by a contemporary friend, Andrea Vanni, and is housed in the Basilica of San Domenico. I must confess, while passing through her sanctuary, this statue of her stopped me in my tracks. 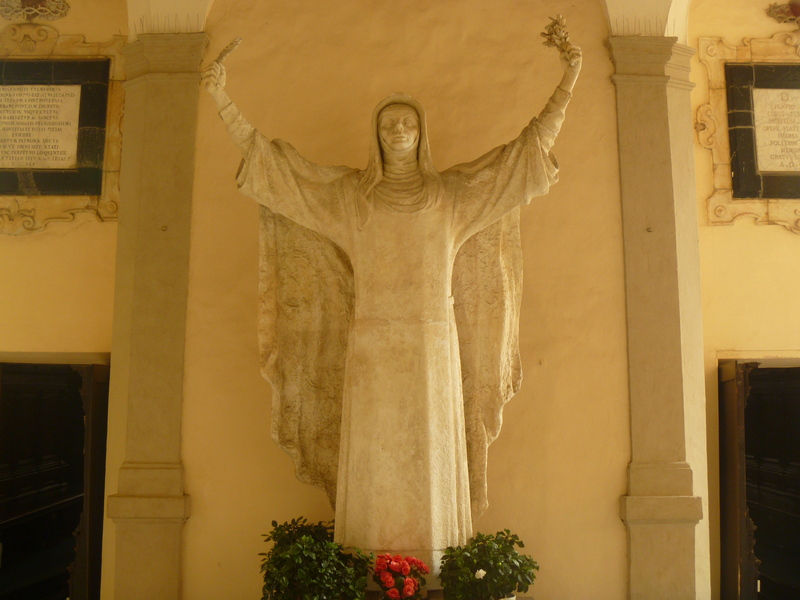 She stands looming with outstretched arms, clutching a crucifix and lilies, and she is huge. At night, lights are positioned to shine up on her, casting ominous shadows on the wall. Very intimidating. Although she tirelessly fought corruption within the church, the impression of fire and brimstone is so far from whom I believe she really was. 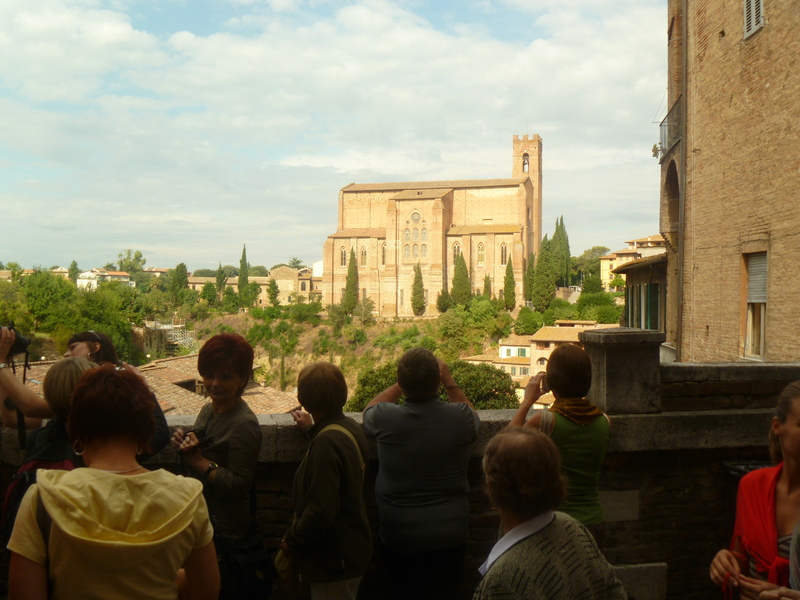 Born Catherine Benincasa in Siena during the late middle ages in 1347, the 23rd child out of 25, Catherine lived amazingly during her short 33 years. Striving for peace in Italy, she acted as liaison between the two great powers, the Holy Roman Emperor and the Papacy. Two supporting parties resulted from these two powerhouses. The Ghibellines comprised the imperial party, and the Guelphs supported the papacy. 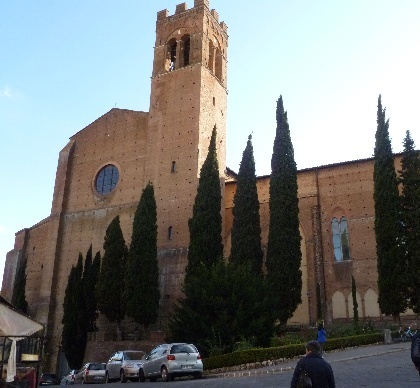 Basilica San Domenico, built in 1226, kept a cell in which St. Catherine spent much of her time. In fact, she hasn’t entirely left. Today her head can be seen inside an urn on a gilded tabernacle in the chapel dedicated to her. Her finger as well. 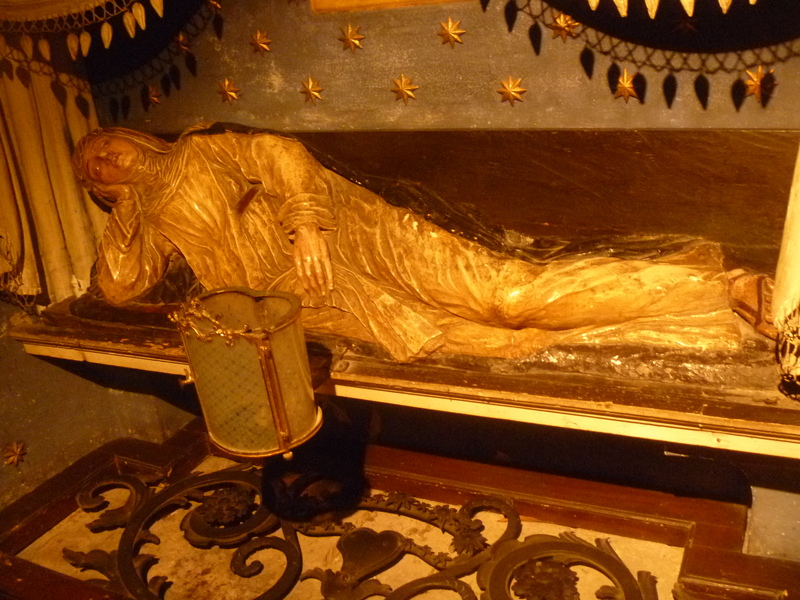 The rest of her is kept in Santa Maria Sopra Minerva in Rome, where she died in 1380. 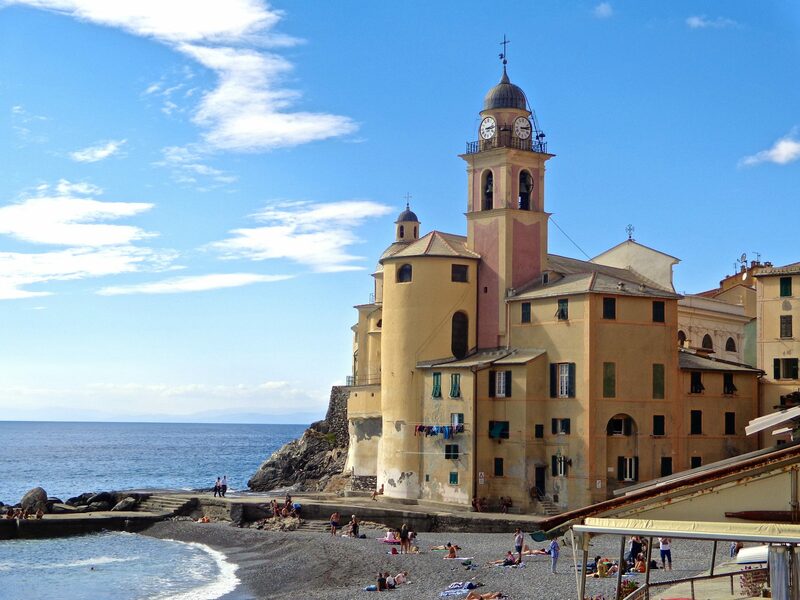 Her bodily remnants are called relics, and those of the saints were highly prized in every Italian city during this time. It was believed that housing a saints body part would protect that city from harm. St. Catherine resting at home. Sadly, Catherine struggled with anorexia. She ate very little and, as a result, her life ended early. This mindset of extreme neglect for the body was prevalent among the saints. They were convince this act brought them closer to God. An author, humanitarian and servant, Catherine possessed a great passion for her faith, for the welfare of others, and for her country. She was greatly respected for her spiritual writings and her political boldness to speak the truth to those with the highest power in the country. It was exceptional for a woman in her time to have such influence on politics and world history. She was illiterate, yet managed to sway the greatest powers and minds of her age.